In a previous post, we looked at the early history of pearl collecting in Mexico. In this post, we carry the history forward to the present-day. The search for oyster shells with pearls inside was revolutionized after 1874 when larger vessels, equipped with diving suits and accompanying equipment, first entered Mexican waters. The newer methods permitted access to shells in much deeper water, and lengthened the season, greatly increasing the industry’s productivity. The dangers associated with pearl hunting changed. Equipment failures and lax supervision cost many lives. According to Kunz and Stevenson, divers confined to diving suits for hours at a time frequently suffered rheumatism, paralysis (due to compression and sudden temperature changes) and partial deafness. On the other hand, diving suits reduced shark attacks. The conditions in Baja California were so favorable for pearling that by 1889, within a few years of its incorporation, the Compañía Perlífera de la Baja California (based in La Paz, and employing about 900 men) had come to completely dominate the world pearling industry. One of the largest pearls found in the Sea of Cortés was one weighing 372 grains found near Mulegé in 1884. On arrival in Paris, its value was estimated at 85,000 francs (about 16 600 dollars at the exchange rate of the time). A 400-grain pearl, found in the same area, now forms part of the Spanish crown jewels. A 1903 article in The New York Times says that the Baja pearl industry had produced more than two million dollars worth of pearls in 1902, including some of the “finest jewels of this kind found anywhere in the world”. The article describes several individual pearls, and emphasizes that the area is “noted for its fancy pearls – that is to say, the colored and especially the black ones”. As mentioned earlier, the native Indians wore fire-blackened pearls. This seems to have been a particularly prescient choice, given the extremely high premiums long placed on natural black pearls. Even today, at least one firm in Baja specializes in producing cultured black pearls from rainbow-lipped oysters. As the twentieth century progressed, cultured and artificial pearls were able to out-compete natural pearls in terms of price and availability. By 1936, a century of rampant overfishing of oyster beds had depleted natural stocks to the point where recovery was unlikely. Finding fifteen to twenty small pearls required the harvesting of a ton of oyster shells. To cap it off, an unknown disease then spread rapidly through the remaining oysters, virtually wiping them out. By the time the American writer John Steinbeck arrived in Baja in 1941, the glory days of Mexican pearling were over. 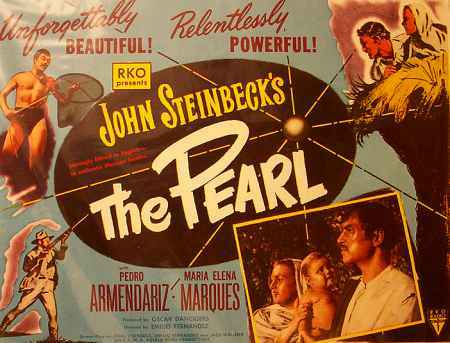 While in La Paz, Steinbeck came across a legendary (and cautionary) local tale about the greed associated with finding a massive pearl. The story became the catalyst for his novella “The Pearl“, published in 1947, in which Kino, an impoverished pearl diver, finds a huge pearl, “The Pearl of the World” which promises to transform his life. It does, but not in the way one might expect. Kino becomes a brutal sociopath; the story, which was later turned into a movie starring Pedro Armendáriz and María Elena Marquéz, becomes a dark tale of the costs of defying traditional customs. Today, very few natural pearls are harvested in the Sea of Cortés, but several Baja California firms cultivate pearls, helping to extend a centuries-old industry into the present. It is especially appropriate, therefore, that the city of La Paz, once the center of the world’s pearling industry, is still known, even today, as the “Pearl of the Sea of Cortés”. Anon. Important Pearl Fisheries on the Coast of California. The New York Times, June 14, 1903. Hardy, R. W. H. 1829 Travels in the Interior of Mexico in 1825, 1826, 1827 and 1828. London: Henry Colburn & Richard Bentley. Reprinted in 1977, Texas: Rio Grande Classics. Kunz, G. F., and Stevenson, C. H. The Book of the Pearl: Its History, Art, Science and Industry. Dover. 2001. Mayo, C. M. Miraculous Air: Journey of a Thousand Miles through Baja California, the Other Mexico. Milkweed Editions. 2007. This post is an edited version of the original article which appeared on MexConnect.